Want to Join Odyssey of the Mind? Before a team can register for Odyssey of the Mind, it must be affiliated with a registered Membership, which is typically held by a school or community organization and costs $135. 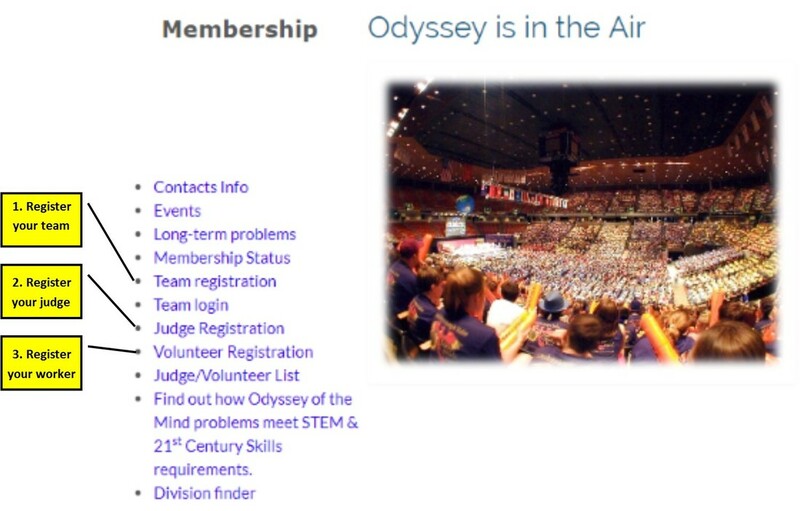 To learn more about Membership Registration, contact the coordinator at your school or sponsoring organization or visit the Odyssey of the Mind headquarters site. For information about starting an Odyssey program in your school or through a community group, see the How to Start an Odyssey Program page. Once your school or sponsoring organization has a Membership Number and you have put together a team, you can register your team. Every registered Membership provides for one team per division for each of the five problems, in addition to an unlimited number of Primary teams, under a single Membership Number. If your school or organization desires to have two teams in the same division solving the same problem, the organization must register for a second Membership, which will be assigned a different Membership Number. A quick summary: Registration now is done through the Members Area of the national website and involves the three parts of registering shown below PLUS payment. The payment deadline means payment received. Judges must attend the mandatory training and judge all day during the regional tournament. Training and tournament dates are on the Dates page. Teams of judges evaluate the performance of teams in the Long-Term, Style or Spontaneous portion of a competition, as well as serving in other vital roles. Each judge is trained ahead of time in the area for which he or she has a responsibility and works alongside experienced Problem Captains and Head Judges. Because of the importance of teams being scored consistently, judges must be present for the entire tournament. Magic Center makes every effort to assign judges to the problem and rule that most interests and suits them. The judge MAY NOT leave his or her assignment to see other teams perform, so a parent is often not an ideal choice to fill this position. Judges must be at least 18 years old AND out of high school. Workers must cover a shift of usually 2 to 3 hours. Among the many tasks volunteers handle are setting up, staffing the registration table, monitoring doors, running scores to the scoreroom, selling merchandise or concessions, controlling traffic, taking meals to judges and breaking down the site. Shifts are scheduled around your team's long-term performance time, so this role is well suited for a parent. ​If your volunteers fail to attend their shift or, in the case of the judge, the mandatory training, the team may incur a penalty. Parents typically volunteer to fill worker roles, but it can be more challenging to find a reliable judge. Some teams find judges among the faculty at their school. Some have a parent who is willing to forgo watching the long-term performance live and make sure another parent takes photos and/or a video. Some find a judge through a parent's work or social connections. Schools with multiple teams might consider working together to approach organizations that provide team volunteer grants (see Volunteer Grant Programs sidebar at right) when groups of employees volunteer together. TRYING TO SIGN UP FOR A WORKSHOP? If you're interested in signing up to attend one of our workshops, check out the﻿ Dates page. There, you'll find dates, times and details, as well as forms to guide you through the sign-up process. Check the policies at your employer, as they vary widely from company to company and often change, but some area companies that may offer such a program include Aetna, Allstate, Boeing, CenturyLink, ConocoPhillips, Covidien, CVS Caremark, Dell, Disney, Duke Energy, ExxonMobil, HCA, Intel, JCPenney, JPMorgan Chase, Microsoft, NextEra Energy (FPL), Outerwall (Coinstar/ Redbox), RealNetworks, Southwest Airlines, Sprint Nextel, SuperValu (Save-a-Lot), Time Warner, Verizon, Walmart and Wells Fargo.